It’s been awhile since I’ve posted…really busy month for us! Tomorrow will be five weeks since Greg’s heart surgery. He continues to do well with his recovery and is getting stronger every day. He has not returned (physically) to work, but has been able to work a lot from home which has been a blessing. He is still not allowed to drive, but that should only be for another week or so. He also still has a five pound limit on what he can lift, which should also be for only another week. He is walking about 3-4 miles almost every day, and for the most part is feeling pretty good. We are so thankful that his recovery has gone so well! Tomorrow evening we will be headed back to Houston. Greg has tests/scans scheduled for all day Thursday. On Friday, he will have another test and then we will meet with the oncologist that afternoon. The reason for the scans and appointments is to determine the next step in treatment. Unfortunately, the tumor in Greg’s leg has grown quite a bit, since he quit taking the oral chemo. But before they start him back on that or choose a different treatment, they want to do complete scans to make sure that there is no other cancer in his body. 1. That our family will handle our current circumstances in a way that pleases the Lord and points others to Him. 2.That there will be NO new cancer found in Greg’s body. 3. That the tumor in his leg would be subcutaneous only, and not involving the muscle and or nerves. 4. That the Lord would give the doctor wisdom and guidance as he makes the decision re: the next step. 5. That we would have a peace and be in agreement with what the doctor recommends. We have been so blessed by the outpouring of love and kindness shown to our family since Greg’s surgery. Thank you to everyone who has provided meals, given gifts, came to the hospital, cared for our kids, prayed for us, sent cards to us, etc!! We have truly experienced God’s goodness and faithfulness! We still have a ways to go on this journey, but are confident that everything that happens in our lives is for our good and His glory! When Greg returned to the room from having his chest X-ray done, she said “Oh, don’t mind us. We’re just having our own little revival!” Before she left the room, she said, “You only thought you were here for heart surgery, you didn’t know that you were actually here to share this with me!” How cool is that????? Well, as soon as I gave her my book I was already thinking about how soon after I got home that I might be able to get out and get myself a new copy! When we returned home a few days later, Greg’s parents picked us up at the airport. When we arrived at our house and unloaded everything from the car, Greg’s mom had a gift bag for me. She said that it was from one of her neighbors. I looked inside and guess what it was? Yep…..a new copy of Jesus Calling!!! Because my God is just cool like that!!!! That neighbor had no idea that I had just given my book away. It was just God’s way of reminding me that He is ALWAYS with me, that He is FOR me, and that He LOVES me!! It was three weeks ago yesterday that Greg had his surgery. His recovery is going really well! The bronchitis has pretty much cleared up, and that has been really helpful in the healing process. He is finally able to sleep in the bed, so he is resting better at night. The seroma in his groin area is finally starting to decrease in size. And…he’s been walking about 1-2 miles most days! He still has some days when he’s really tired, but he has been able to work from home a good bit the last week or so. He has been tolerating the pain really well, usually only taking one or two pain pills a day. Unfortunately, the tumor in Greg’s leg seems to be growing at a pretty rapid pace. He has been off of all chemo since a few days before the surgery. He’ll probably put a call in to the oncologist next week to see if they want him to restart the oral chemo. As of now, he has some follow-up appointments scheduled the first part of May. We will find out then what the next step in treatment will be. We continue to be blessed and encouraged by the many prayers, notes, gifts, visits and meals from our family and friends! Thank you all for being so faithful!! 1. Sometimes your life is hard to look at. I will try to attend your daughter’s wedding and I will be so happy for her. But I will look away when her father walks her down the aisle and I will leave before the daddy-daughter dance. These things are too much for me. I’m not mad; I’m just swimming through some deep-water feelings about the future. I don’t need hugs or help; I just need a little room to breathe and none of it is your fault. This is my heartache. For some, it’s seeing an anniversary celebration on facebook, or flirtatious banter between a husband and wife. For others, it’s witnessing the baby milestone while imagining how old their own would be. Different things are difficult for different people, just know that while we love you, sometimes your world is hard to look at. We know you have problems, too, and we’re not jealous of your life – we’re jealous for the life we used to have before our battle broke out (or the life we’re wishing for that hasn’t quite started yet). Action point for armies: don’t stop inviting us into your lives, but give us grace when we need to look away for a bit. 4. We still want to fight for you, too. Don’t stop telling us what you’re going through, don’t stop asking us to pray. It gives me comfort to know I’m not the only one in a fierce fight and it gives me courage to know that I still have something to offer the world outside my war. 5. We love you. And we’d be lost without your friendship. Even when we lack the strength to say it or show it, please just know it. It’s that time of year in Georgia…..pollen time! Our porch, driveway and vehicles are now yellow. Sometimes when the wind is blowing slightly, you can literally see the pollen blowing through the air just like a yellow haze! It’s causing itchy eyes, runny noses, scratchy throats and aggravating coughs. Unfortunately, I think it has gotten to Greg and has led to a respiratory infection. As you can imagine, coughing is quite painful for him at this time. He is presently taking antibiotics…today is day 3. We are praying that it will clear up soon! Also because of the pollen, he’s not been outside to walk like he would like to. Other than the respiratory infection, he is doing pretty well. He’s taking very little pain medicine. He’s getting up and down better, but still can not get comfortable in the bed. Instead, he’s been sleeping partially sitting up on the couch. He has much more energy and his appetite is back to normal! There is still some swelling in his right lower leg and ankle. The seroma does not seem to be getting smaller, but thankfully is showing no signs of infection. He spoke with one of the surgeon’s nurses and she said that it takes quite awhile for it to resolve and to just keep watching it. 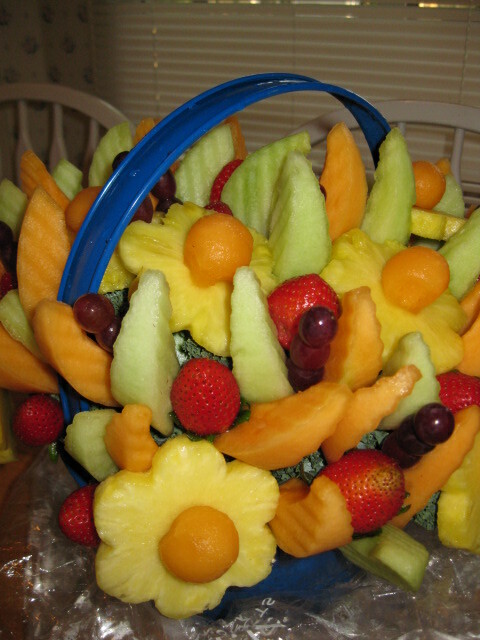 A beautiful gift from Edible Arrangements! 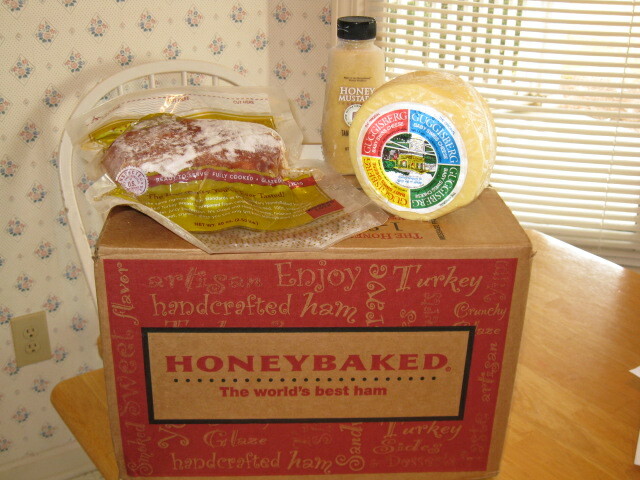 A delicious package from Honey Baked Ham! Jacob loved playing with the dry ice that the food was packed in! 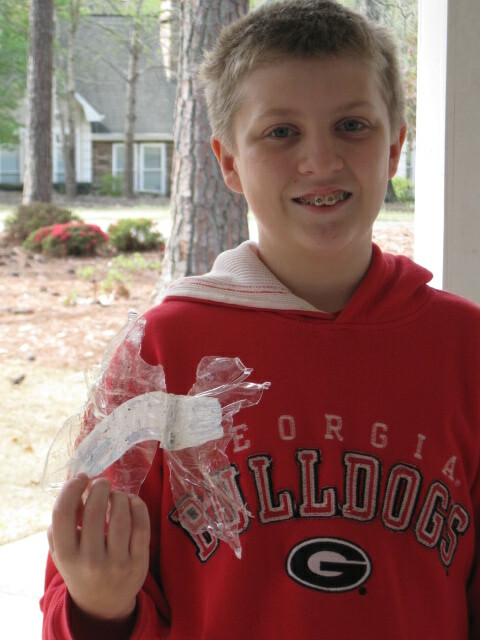 Great science experiment!! 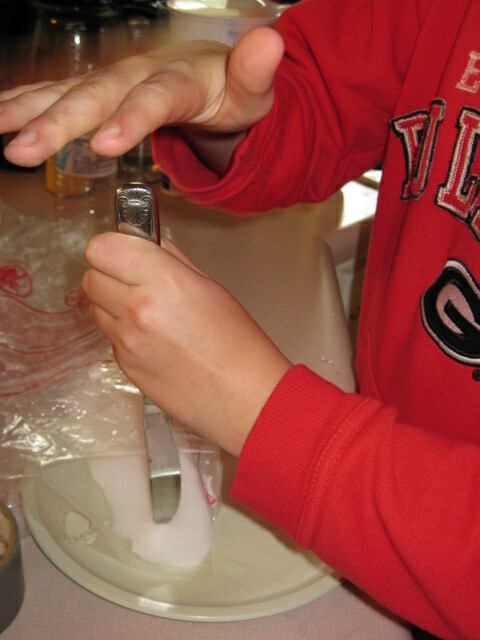 Breaking up the ice to put in the bottle. 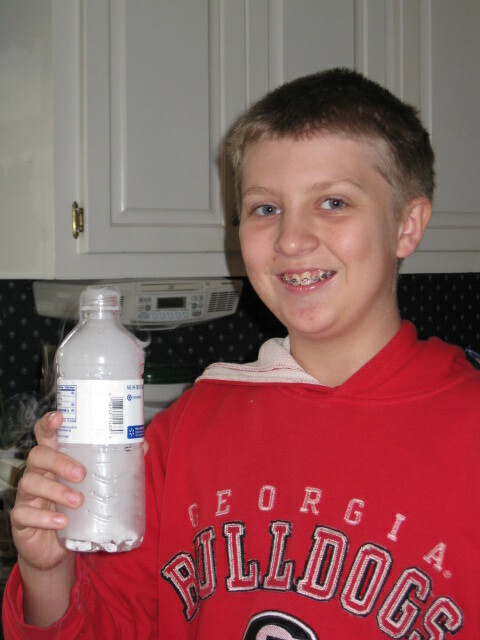 The bottle of dry ice before the “explosion”!! The bottle after the “explosion”!!!! We are so thankful for all of the kindnesses shown to our family over the past months….prayers, cards, gifts, meals, visits, etc! It has not been an easy road to travel, but the Lord goes with us. He is faithful and He is good! Please continue to pray that the infection that Greg has will clear up soon and that his recovery will continue with no further complications. We’ve been home a few days now and Greg continues to show improvement! Each day he is less tired and weak, and is moving around a little better. He walked about a mile both yesterday and today. It really tires him out, but he seems to be tolerating it well. The swelling in his lower legs and ankles is going down and his appetite is going up! Speaking of food, we’ve had family and friends bringing us meals every day since we’ve been home. This has been a huge blessing! I have been so tired and trying to catch up on my sleep, the last thing I wanted to do was plan and cook dinner! The chest tube site seems to be draining less and beginning to heal. The seroma in Greg’s groin is still giving him some problems and doesn’t seem to be getting much smaller. May have to call about that next week, if it doesn’t begin to improve. Also, the tumor in his thigh seems to be getting larger. He will probably begin taking the oral chemo again, but we’re not sure when. He needs time to recover from the surgery first. We are thankful that Greg is improving and continue to pray that he will have a quick and complete recovery! Thank you all for your concern and prayers for our family! We are home!! The flight and getting through both airports was easier than I had anticipated! Nice people on both sides to get us a wheelchair and get us where we needed to go. Flight was a little bumpy due to the weather, but all in all, no problems. We got home about 10pm. Emilie had done a great job in having the house nice and clean when we came in! And Katie had made a meal and put it in the freezer for us before she went back to school earlier this week! I thought that we would sleep soundly last night after being gone so long, but we both woke up several times throughout the night. Greg started out in the bed, then ended up moving to the couch. He’s feeling pretty well today and is presently snoozing in his recliner! He is still really tired and weak, but much improved since the blood transfusion. Still retaining fluid…trying to drink lots of water today to try to flush everything out. His appetite has been better. The pain is manageable with medication. We are so thankful to be home and think Greg’s recovery will go much smoother being here. Follow up appointments are scheduled for May. Not yet sure of the next steps in treatment. We think it will be to remove the tumor in his leg, but not sure. Thanks again to our amazing friends and family for all of your support! We love you guys!